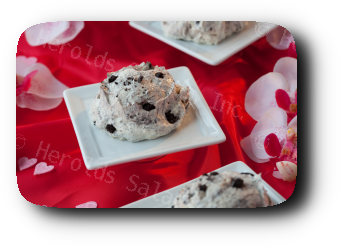 Coco Cookie Mousse – Whipped topping and vanilla pudding made with whole milk, blended together with cream filled chocolate cookie bits. Hawaiian Twist – Whipped topping, mandarin oranges, pineapple tidbits, miniature marshmallows and coconut blended together makes this a heavenly dessert! Pistachio Fluff - Pistachio pudding, whipped topping, mini marshmallows, almond, pecans, and crushed pineapple. Pumpkin Mousse – Light fluffy whipped topping with pumpkin with a touch of spices. Available from Oct-Nov.